This weekend, I invited a few of my favorite people over for a cozy and relaxed Fall lunch party at home. After a busy summer, it felt really great to finally relax and catch-up with friends over delicious food and drinks. 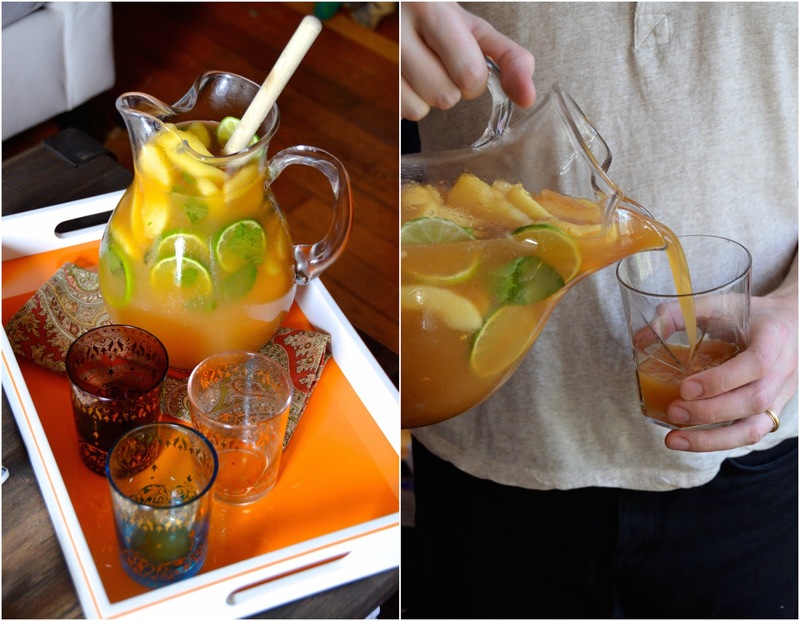 My party menu was inspired by a new product I've been working with this season called Dole Fruit n' Spice, which is a line of spiced frozen fruit that combines fruit like mangos, pineapple, and apples with spices like chili and cinnamon. It's a new product and I hadn't heard about it until I started working with them, but I'm genuinely obsessed with how good they are, and with all the ways you can use them to make both sweet and savory recipes. 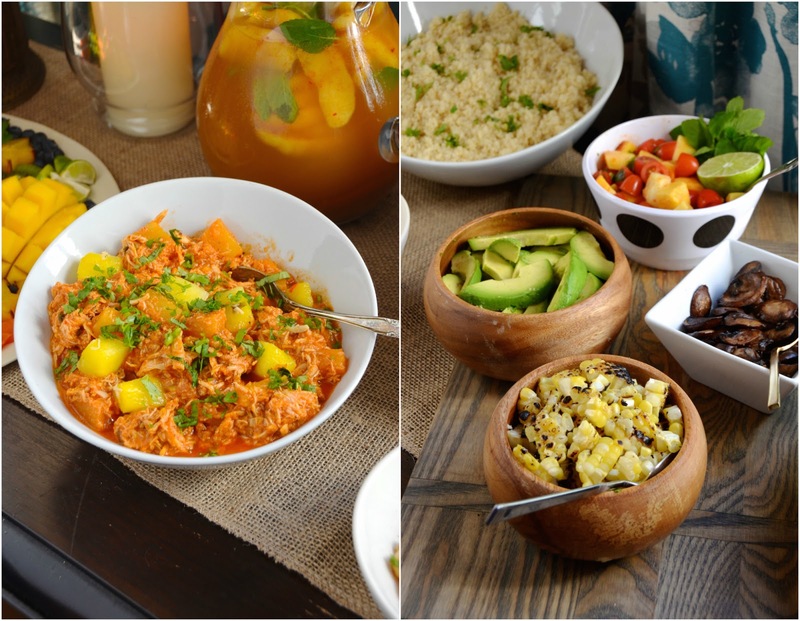 The brand asked me to create two recipes to serve at the party, but I couldn't help myself and ended up using them in about 6 different ways. 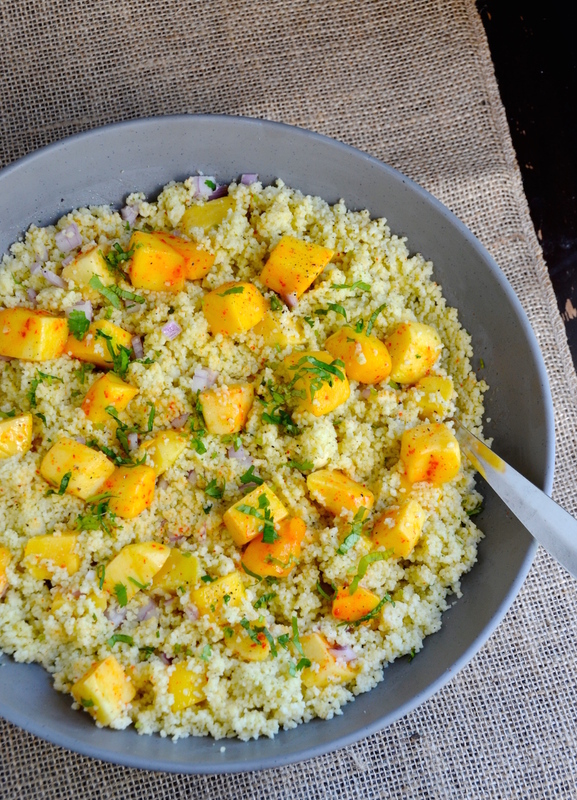 The star of the menu was my Coconut Mango Couscous Salad (recipe below! 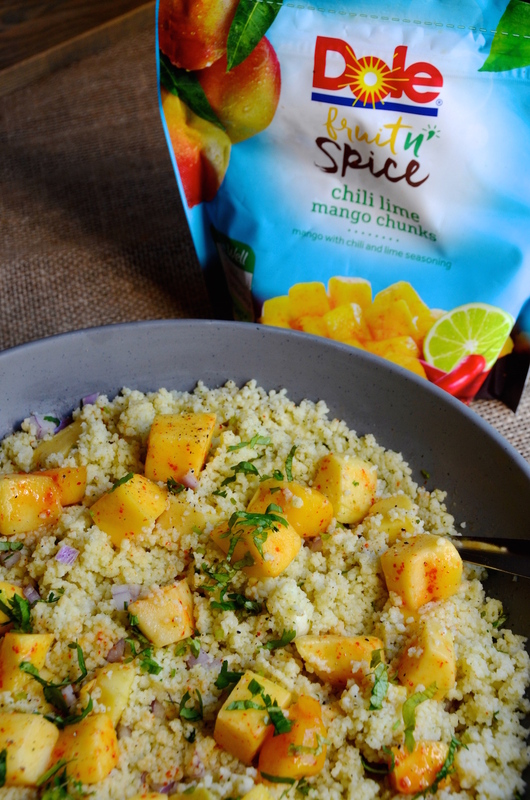 ), made with coconut-simmered couscous and tossed with Fruit n' Spice Chili Lime Mango, chopped cilantro, and a tangy lime vinaigrette dressing. I love DIY style party menus that give guests the opportunity to create their own perfect plate, so that's what I did here. 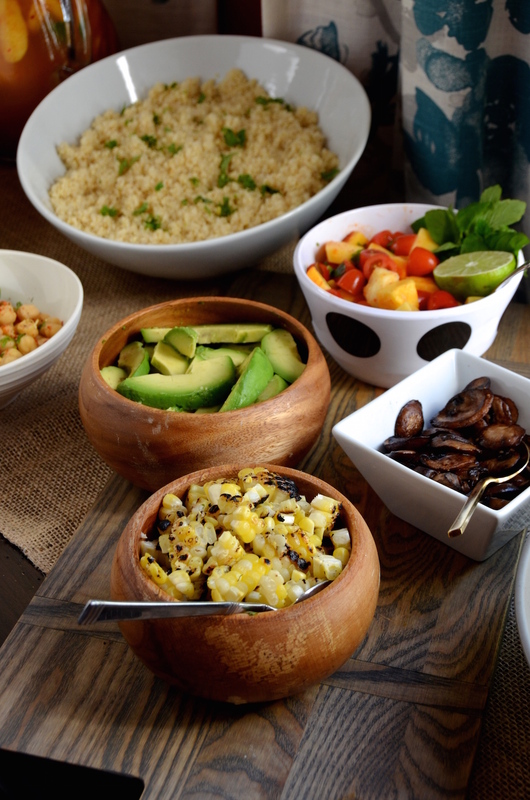 I created a DIY Grain Bowl Buffet with the aforementioned couscous, cilantro-lime quinoa, and then a whole bunch of fun toppings. 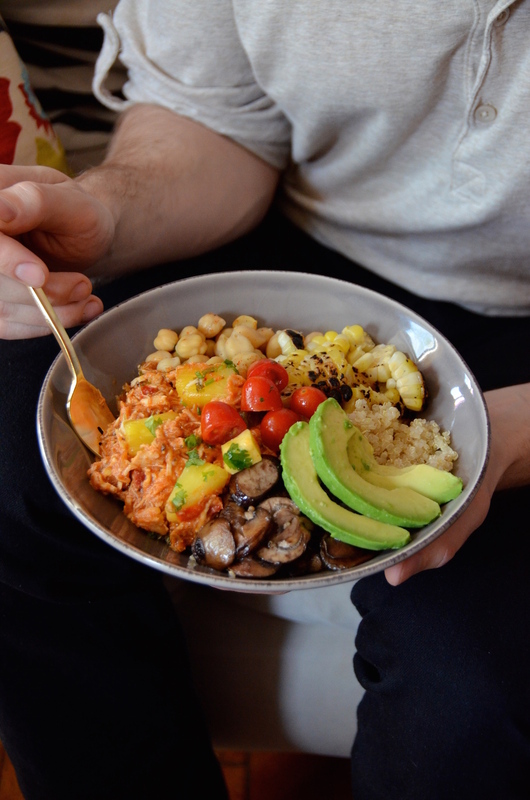 For proteins I made a delicious Pineapple Shredded Chicken (yes, using the Honey Lime Pineapple) and Smokey Spiced Chickpeas as a vegetarian option. And then the toppings! Charred sweet corn (it is SO good right now--I've been buying it at the farmer's market every week), sauteed button mushrooms, mango pico de gallo (using the Chili Lime Mango, again! ), sliced avocado, sour cream, grated queso blanco, and various hot sauces. 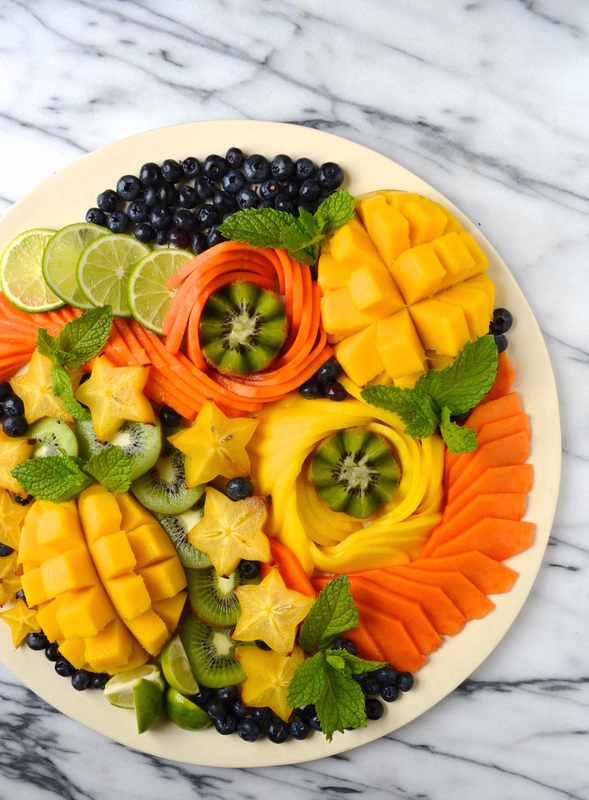 To echo the tropical theme of the menu, I also made a tropical fruit platter that turned out so lovely it practically doubled as party decor. For drinks, I made Spicy Pineapple Moscow Mules by muddling vodka and fresh lime juice with Honey Lime Pineapple chunks. 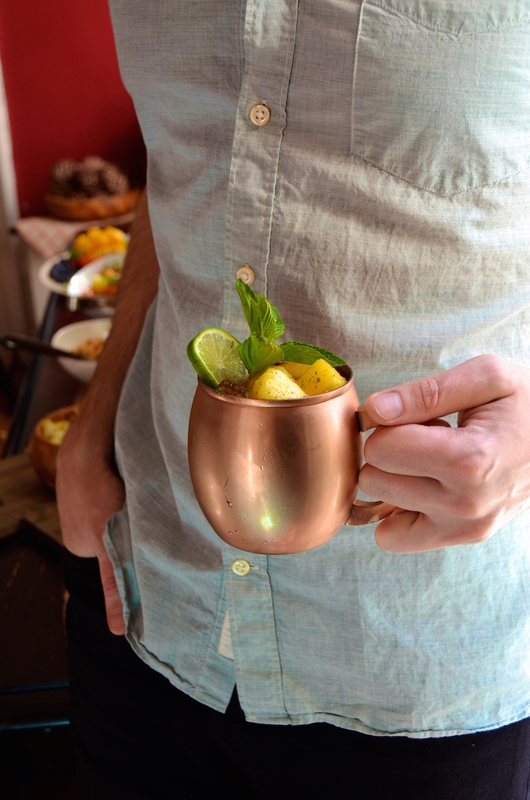 Then made the drinks to order by combining with ginger beer soda and fresh mint as a garnish. Simple party menus like this are the best as they require very little work from the host, making it possible for you to enjoy the company and conversation just as much as everyone else. Thanks to Dole Fruit n' Spice for sponsoring this post. I was compensated for my work, but all the ideas and recipes are totally my own. I hope this has inspired you to host a similar occasion soon! 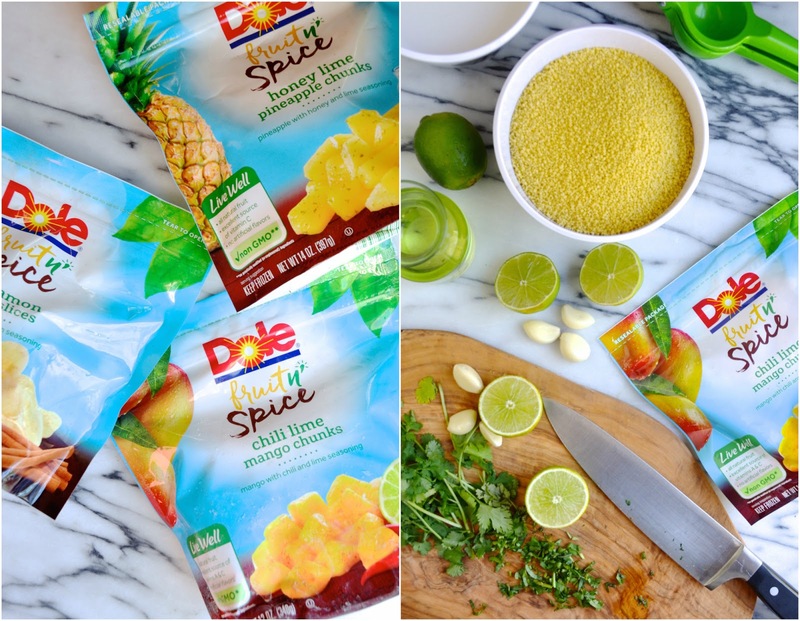 Click here to learn more about Dole Fruit n' Spice, and to find out where it's sold in your area. Combine coconut milk, water, and salt in a medium pot, and bring to a boil. Stir in coconut, cover, and remove from heat. Let sit 5 minutes, then uncover and fluff with a fork. While couscous sits, combine olive oil, lime juice, garlic, and about 3/4 of the cilantro in a large mixing bowl and whisk well. Add the couscous to the dressing along with the Dole Chili Lime Mango Chunks and diced onions. Toss to coat well, then taste and adjust seasoning as needed. Garnish the top with remaining cilantro and toasted coconut flakes, if using.